Personalize this dog tag-inspired necklace with your favorite traits, or whatever best describes you. Are you fierce mama? A wonder woman? A pinball wizard? 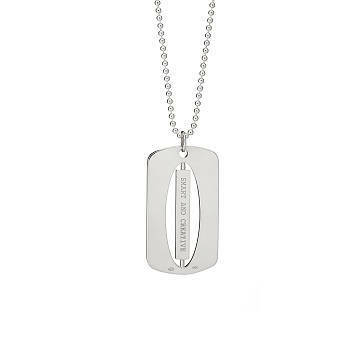 Inspired by classic military dog tags, this sterling silver version identifies you by more than a name (though you can choose that, too). Personalize it on both sides with your favorite traits, or whatever best describes you—it's a timeless piece you can wear every day, because individuality is always in style. Made in Kentucky.